A belated happy new year from us, apologies it's been so long since anything new was uploaded, but we've just been so busy it's been impossible to find the time! 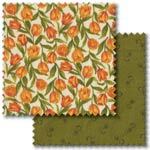 Finally we have managed to scan a couple of new ranges (several more should be done over the next week or so) - firstly we have the Tulip Festival patchwork fabric range by Jackie Robinson for Benartex, a beautiful range of traditional florals in warm tones of cream, red, gold and green. Graceful tulips and elegant tonals make for gorgeous quilts, bringing a touch of colour and grace to any room! The eight prints are also available as a stash pack or discounted fat quarter pack. 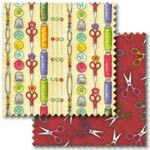 The other new range now available is Sew Be It by Debi Hron for Henry Glass Fabrics. We couldn't resist these fun, sewing related prints - with motifs such as scissors, sewing machines, dress forms and buttons all on brightly coloured backgrounds, these fabrics would be ideal in loads of projects for or by quilters and sewers! Again, all six fabrics in stock are available as a stash pack or fat quarter pack.